Once many of the natural teeth have been lost or decayed to the point that they are non-restorable, the best restorative dentistry option is sometimes a complete upper and lower denture. Dentures have the ability to restore a dentally compromised patient to a very esthetically pleasing and functional result. Dr. Saran also works with digital technology to provide patients with a more precise fitting denture faster than conventional dentures! 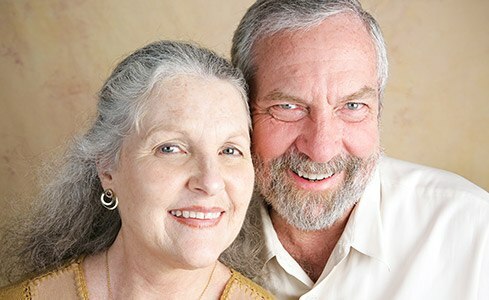 Why Choose LIC Dental Associates for Dentures? A great option for restoring a patient’s smile who is missing a few teeth in either the upper or lower arch is called a partial denture. There are two types of partial dentures. Metal cast partial dentures have a framework that’s crafted from high-quality metal and custom-designed to lock onto the existing teeth. The other type is acrylic painted dentures, which provide a highly esthetic result. These dentures are fabricated entirely of acrylic material and snap into place around the existing teeth. Many patients end up needing upper and lower dentures due to an overall lack of dental health. One of the biggest complaints for these patients is the unexpected movement or instability of the denture, especially the lower denture. New technology offers a solution to this problem. 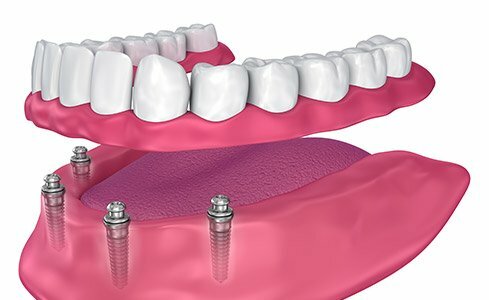 By placing several state-of-the-art dental implants in the jaw and outfitting the existing denture with custom attachments, it is possible for a denture to snap into place, providing a secure, sound restorative option for denture wearers.